We can reduce ships down time with our specialized hull cleaning equipment, including complete brush carts hydraulic systems, with different types of scrubbing brushes, capable of cleaning an entire hull, within one day. Hull cleaning and general maintenance on seawater induction grids and sea chests. 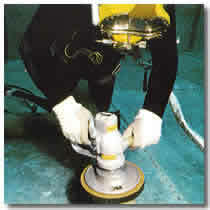 U/W inspections and photographic surveys of hulls, anodes and machinery. U/W maintenance of oil drilling vessels and barges.